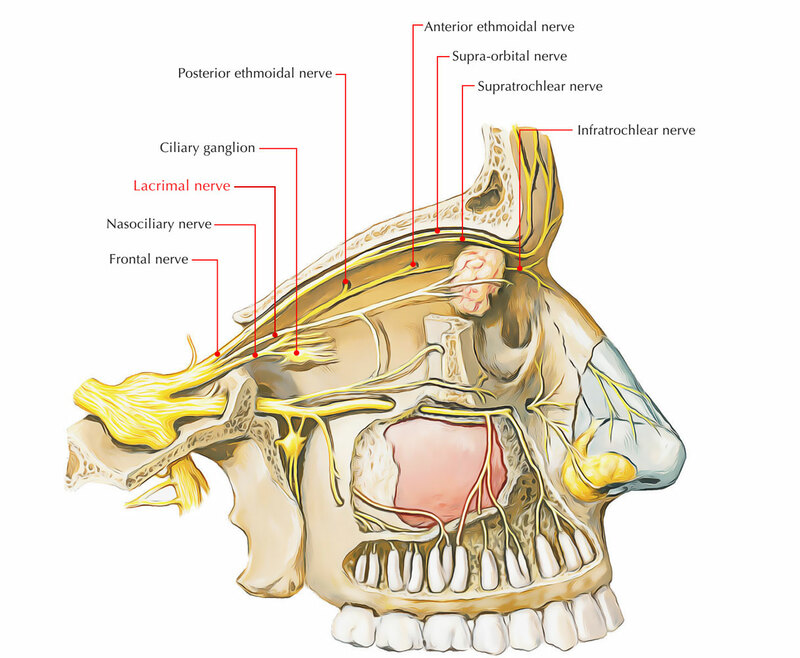 The lacrimal nerve is the smallest among the three branches of the ophthalmic nerve, once inside the orbit it travels onward alongside the upper margin of the lateral rectus muscle; along with lacrimal artery it goes with the lateral wall of the orbit and concludes in the lacrimal gland. Within the superior orbital fissure, it is the most superior structure. It is the most lateral nerve that travels via the superior orbital fissure. It travels laterally outwards the cone of muscles as it moves inside the orbit, along the superior margin of the lateral rectus muscle and beneath the periosteum of the orbital plate of the frontal bone. From the pterygopalatine ganglion via the zygomaticotemporal nerve, it obtains secretomotor parasympathetic fibres inside the orbit as well as sympathetic fibres from the adjacent lacrimal artery, which supply the lacrimal gland. It supplies the conjunctiva of the lateral upper eyelid and superior fornix. It then exits the orbit under the superior orbital margin laterally to supply the skin of the lateral forehead and scalp, lateral upper eyelid and around the lateral canthus.